Dipping truffles and other candy centers in chocolate adds a beautiful, delicious finishing touch. Without the chocolate coating, many candies are just too soft or sticky to package, transport, or eat. But if you dip truffles incorrectly, you might be left with lumpy candies with cracked, streaked, or bumpy chocolate coatings and nobody wants that! One of the biggest problems people encounter when dipping truffles is keeping their truffles round and intact when dipping in warm chocolate. If the truffles are too soft, they will become misshapen or even melt into the chocolate, yielding a lumpy mess. If they are refrigerated before dipping, the chocolate coating is more likely to crack. One solution to this problem is to let your rolled truffles sit at cool room temperature overnight before dipping them. This setting period will form a "skin" around the outside of the truffle, which helps them keep their shape and also eliminates the need for refrigeration before dipping. Warm environments and specific recipes may not work with this technique, but in general, it can be a very helpful trick to making nicely dipped truffles. The big question is, should you use real chocolate or chocolate-flavored candy coating? Both options have pros and cons: real chocolate tastes better, but for the best results it should be tempered, and tempering takes time and can be tricky. Chocolate coating doesn't taste as nice as real chocolate, but it is inexpensive, easy to work with, and produces fast, consistent results. If you decide to use chocolate candy coating, go to step 3, and if you decide to use real chocolate, go to step 4. If your chocolate coating is in bar form, it will need to be chopped in order to melt evenly and not overheat. Many coating brands come in wafer form, so if you have wafers you don't need to worry about chopping them. For professional-looking dipped candies, your chocolate should be tempered. Chocolate that has been tempered is smooth, with a shiny finish and a satisfying snap. Tempering is not a difficult process, but it can take time and requires a chocolate thermometer. Note that if you are pressed for time you can simply melt your chocolate instead of tempering it, but the resulting candies will probably have to remain refrigerated or they will begin to get soft or sticky at room temperature. It is best to have everything ready before you begin dipping. Place your bowl of melted chocolate at your clean workstation and set out your dipping tools (or dinner forks). Cover a baking sheet with a clean piece of parchment, waxed paper, or aluminum foil for placing the finished candies on. Slide the edge of your fork or dipping tool under the truffle or candy center, and lift it up gently. Drop the truffle into the melted chocolate and push it just under the surface of the chocolate. Lift it out of the chocolate with the fork, and tap the fork several times against the side of the bowl. Slide the bottom of the fork over the lip of the bowl to remove any excess chocolate. Place the fork over the prepared baking sheet, and tilt the fork so the edge of the truffle touches the sheet. Smoothly slide the fork out from under the truffle. If you are adding decorations or garnishes to your candies, do it now, when the chocolate is still wet. Repeat the process with the remaining centers and chocolate. If the temperature of your room is moderately cool (60 to 70 degrees) your candies can be left out to set, but if your room is warm, or you want to speed up the process, you can refrigerate them for approximately 10 minutes to set the chocolate. The exception is untempered chocolate, which should always be refrigerated after dipping. 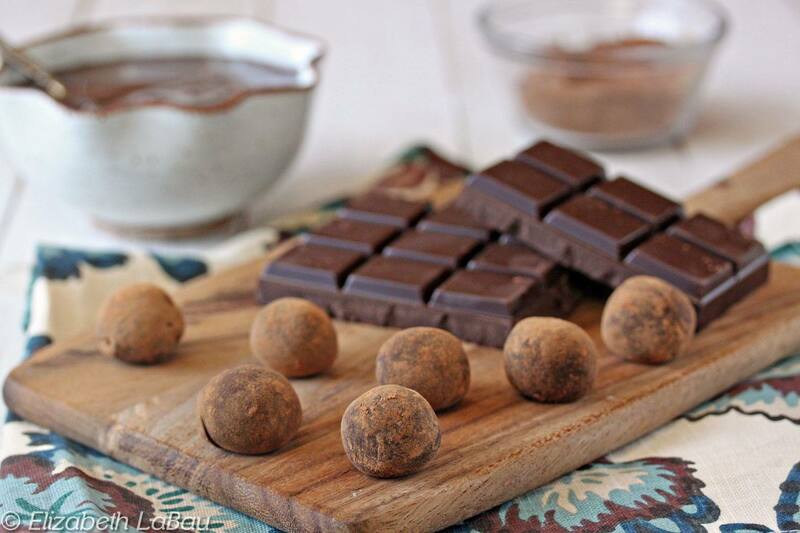 Once the chocolate has set, you might notice a small pool of chocolate forming "feet" at the bottom of your truffles. If desired, you can trim them with a small sharp paring knife. Wear gloves to avoid getting fingerprints on your candies, and place them on a flat surface. Grip the candy in one hand, and use the paring knife to press down on the excess chocolate and cut it off in short clean strokes. Trimming the candies is purely an aesthetic decision, and you can certainly skip this step if desired.